Holly Mabutas of Eat Cake Graphics just posted an adorable free Santa pattern on her blog Sprinkles of Thought. 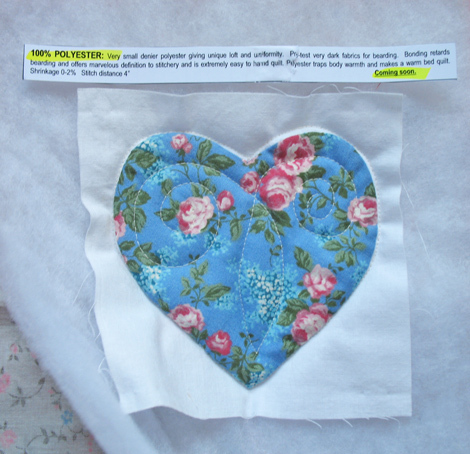 Like all of Holly’s artwork, the pattern’s special and wonderful. 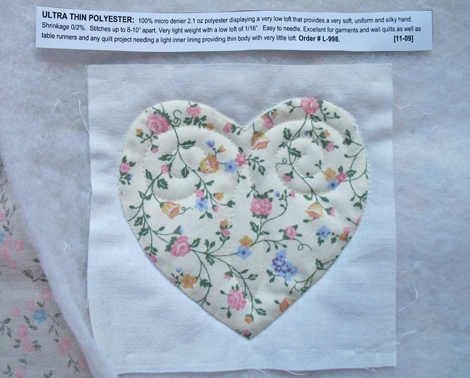 Be sure to take a look at all the quilt patterns and rubber stamps at Eat Cake Graphics. You’ll be glad you did. I keep telling Holly’s she’s the next Mary Engelbreit, Susan Branch, and Debbie Mumm all rolled into one. If you like scrapbooking, be sure to subscribe to A Sprinkling of Samples, which shows what ‘bookers have done with Eat Cake stamps. So creative, and a feast for the eyes. I finally get to write about something I’ve been wanting to get to since January. 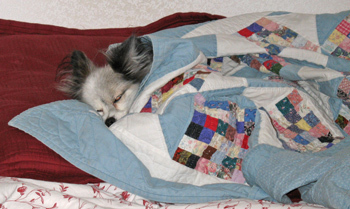 Now that my quilts for the new book are finished and safely arrived at the Martingale offices, I can actually pick up my head and look around! 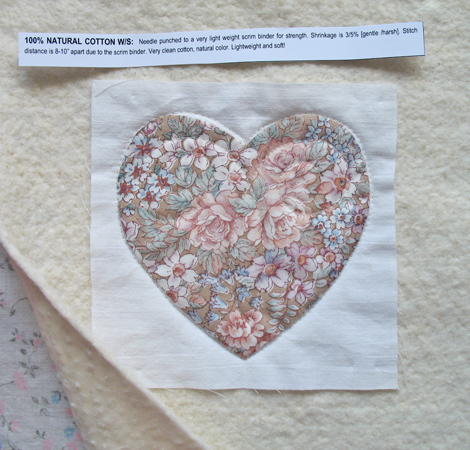 Before the Road to California show in January, I received a very nice invitation from Darlene Christopherson, esteemed appliqué artist and Marketing Developer for the Pellon Quilt Division. Pellon was having a booth at the show, and Darlene invited designers to come by and receive a sample of Pellon’s new Legacy brand battings. Naturally, I was happy to do so. I was presented with a sample pack of 15 different battings. Wow, that’s a lot of styles! 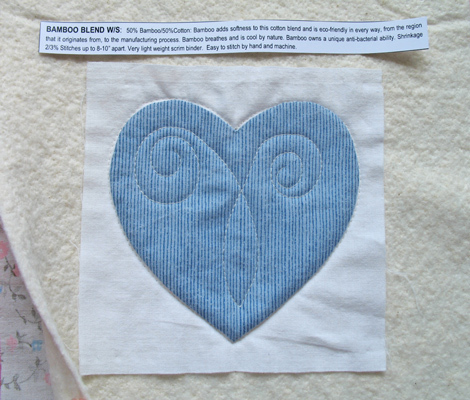 I’ve been itching to stitch up some samples to share on the blog. What came to mind are some ancient appliquéd hearts that have been marinating in unfinished-land for you wouldn’t believe how many years. Let’s just say that when you see some of the fabrics you may take a trip on the hot tub time machine back to the 80s. 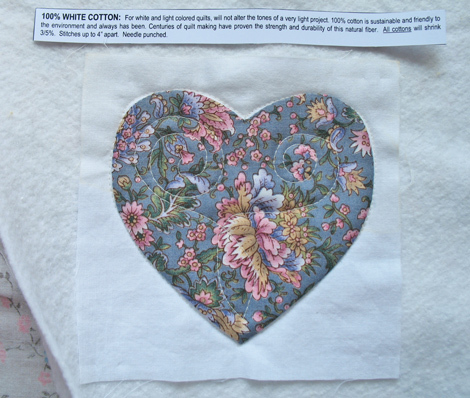 Apparently when I was a young green quilter I thought I would appliqué a heart out of each fabric in my stash, onto bleached muslin. Well you can imagine how long that lasted. Sigh, the naiveté of youth. 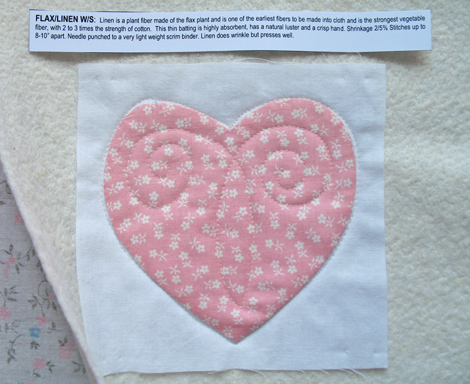 Gentle quilters, I didn’t take the time to hand quilt any of them, just whizzed them up on the Bernina with some swirlies. 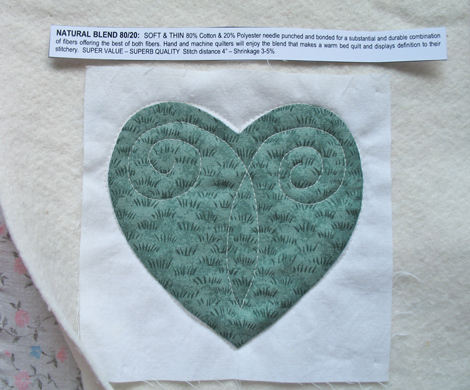 Some of the swirlies are more “interesting” than others and I make no claims about my machine quilting. Sorry you can’t feel these But I hope there’ll be some useful information here. 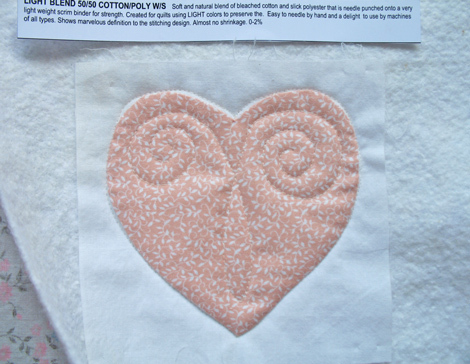 I did the poofy poly and wool ones too, though these probably aren’t the styles you’d choose for machine quilting. And last but not least, how about this dramatic back batting? I like a low-loft batting myself, and all of the first 12 were fine and dandy for what I do. It’s very interesting the different fibers used… you can choose from cotton, poly, linen, flax, bamboo, soy, rayon, and blends of more than one. 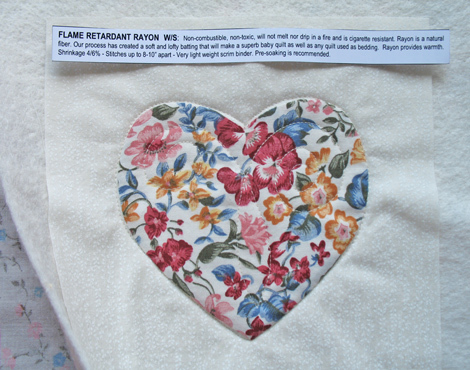 When I first started quilting there was Mountain Mist and Mountain Mist. We have so many choices now! Jump out of your box! 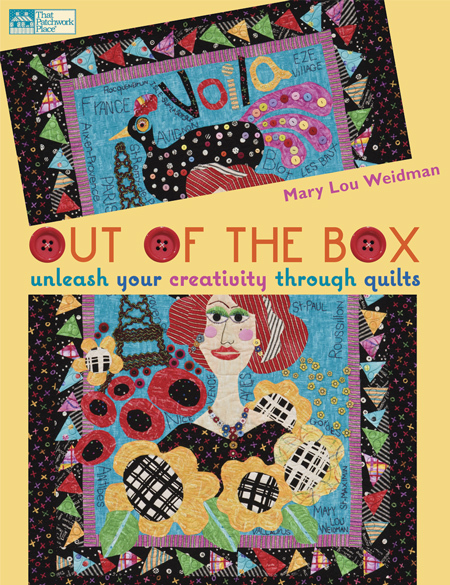 Mary Lou Weidman is one of my most favorite admired quiltmakers and authors. 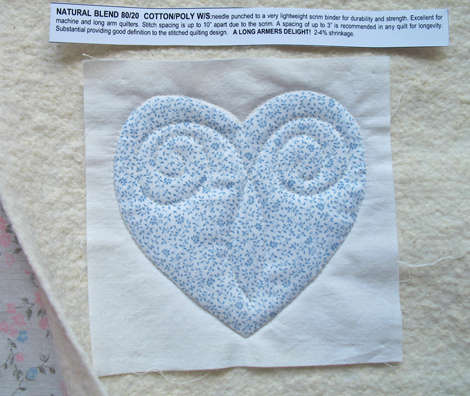 Her Whimsies & Whynots: A Playful Approach to Quiltmaking has been on my bookshelf for years. 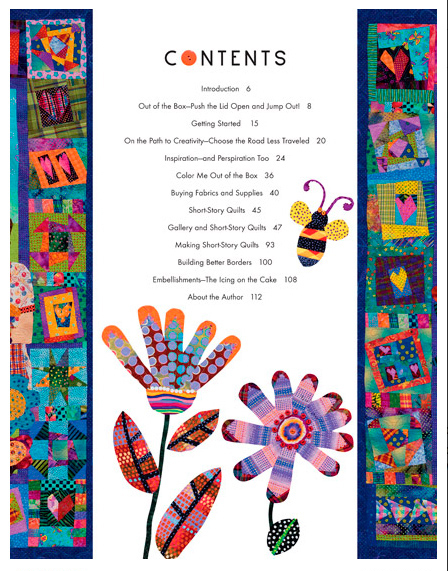 And so it was with great pleasure that I received a copy of Mary Lou’s latest book Out of the Box: Unleash Your Creativity Through Quilts from Martingale & Company as our featured appliqué book for this month. 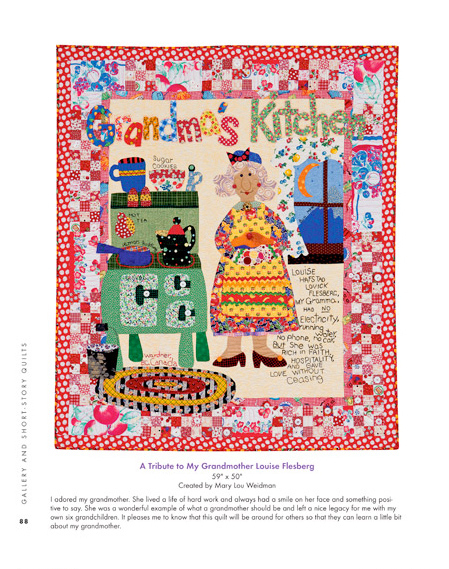 Mary Lou’s quiltmaking style is one of riotous, colorful fun, personal meaning, and brave and fearless fabric choices. (It was through her that I first noticed and learned to appreciate the color “cheddar.”) This book is an inspiration to anyone who is willing to be inspired, and Mary Lou writes at length about the process of discovering your inner artist, inviting play and discovery, and listening to yourself instead of to your friends and/or critics. Every day you have at your disposal the ability to think big, think colorful, think happy, think with large imaginative images, think clever, think expressive, think funny, think lofty, think about the past, think about the future, and think things that no one but you can think of. You have the ability to think ‘out of the box’ and to share your wonderful thoughts and your imagination with others in the form of art, in this case, quilts. 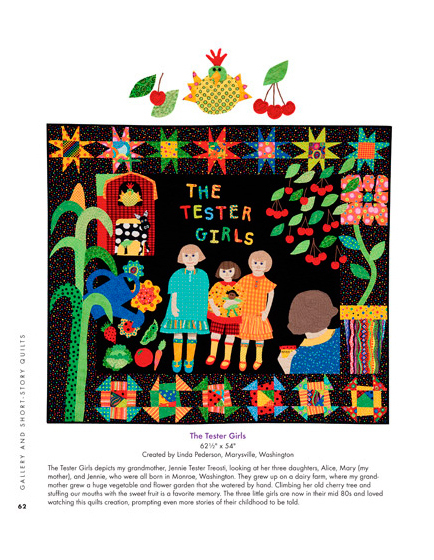 How different is that from the quilting rut of choosing colors and fabrics that “go” with our living rooms, of fretting over “perfect” precise blocks, of fearing the quilt police so that our childlike creative voices are stifled? What is out of the box? “Push the lid open and jump out!” says Mary Lou, and she gives us a checklist of 24 sample items to test our position in relation to the box. After administering this self-test I discovered that I am not quite out LOL, but I can peep over the lid. Mary Lou emphasizes the need to think and daydream, and this struck a chord with me as well. Often, what happens to me during shows is that when I have some down time… slow periods on the show floor, or upon waking up too early in the morning… I seize a pen and paper and write down long list of thoughts that flood into my brain. 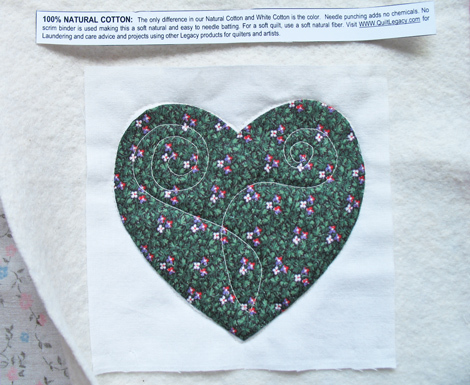 The inspiration and energy that comes from being at a quilt show turns on a tap for me and I love it when the daydreaming flow of creativity starts. Mary Lou says we need to set aside time for this every day to doodle, think, and imagine. There’s a list of creativity stoppers to watch out for (like, ‘there is only one right answer’), pages and pages of inspiration exercises and sources found in our everyday lives, how the author shops for fabric, a section on words in quilts, and lots of information on color. How about being shown the eight styles of fabric! This was an eye-opener for me and something I especially enjoyed. 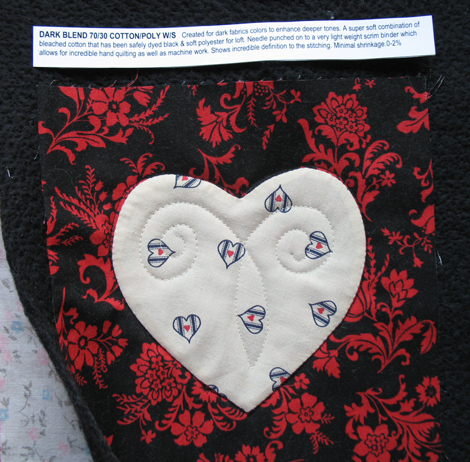 Then there’s an extensive gallery of the author’s quilts and short-story quilts made by her friends and students. Martingale has done their usual fantastic job on the photography… kudos Brent Kane!!! The quilts burst from the pages. 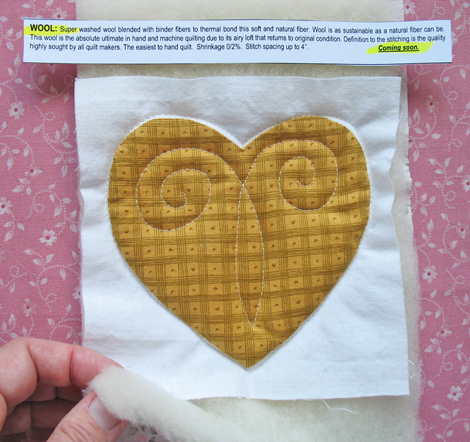 Mary Lou finishes up the book by talking about the making of short-story quilts and how you can derive them from your own life. 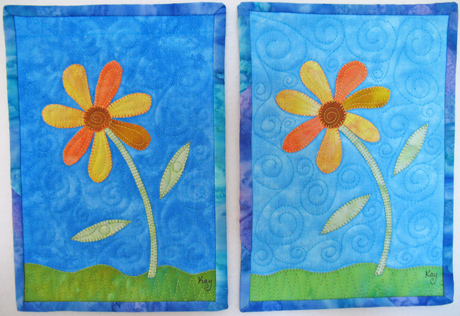 She shares “secrets” of scale, theme, focus, design elements, drawing, creating patterns, and also shares her own methods of appliqué. 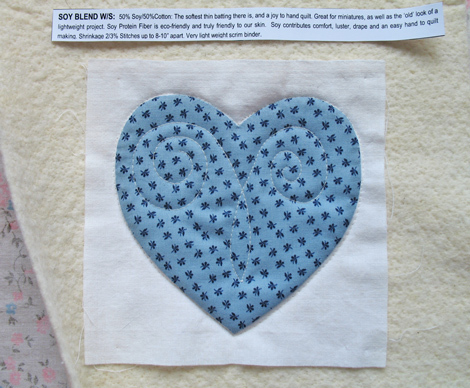 Borders, quilting, finishing, and embellishing (‘the icing on the cake’) are also included. Out of the Box is quite a pep talk and an energizing boost! If you’d like to win a copy, leave a comment before 7:00 p.m. California time on Tuesday, April 6, 2010. (U.S. and Canada only.) 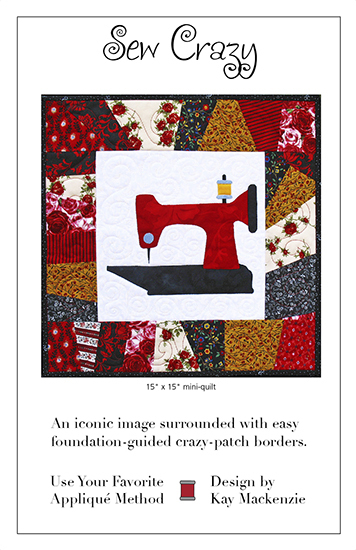 Tell us why you need this book in your quiltmaking life! 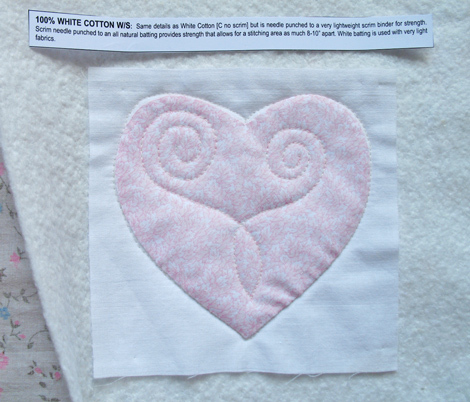 The winner will also receive a copy of my book Easy Appliqué Blocks: 50 Designs in 5 Sizes. Thank you Martingale!